The opal is unique among gemstones because of its composition; it is made of hydrated silica spheres. These spheres reflect the light striking the opal like tiny prisms, creating thousands of rainbows which change in color as the stone is moved. 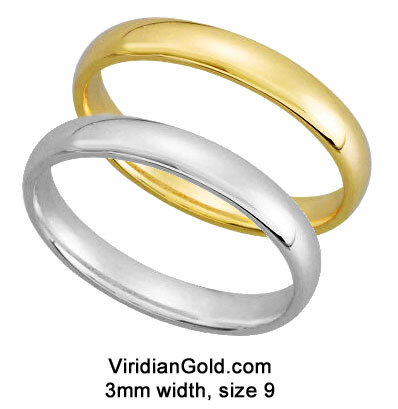 Historically, the opal has been a symbol of fidelity and assurance, and at Viridian Gold, you will find it paired with diamonds or other gemstones in beautiful jewelry pieces. For instance, our classic White Gold Opal and Diamond Pendant #5145 is composed of a cabochon polished white opal, set in a white gold design embellished with three high-quality brilliant-cut white diamonds. 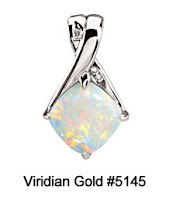 Opal comes in other base colors besides white. 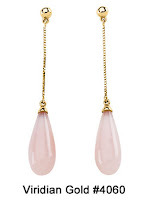 A good example is our Yellow Gold Pink Opal Briolette Earrings #4060, which is one of several opal earring styles we offer. 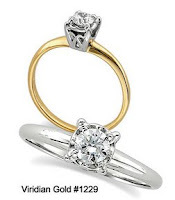 See all of our Opal Jewelry at Viridian Gold, and while you are there, explore the hundreds of other items in our Gemstone Jewelry Collection!